It might seem to some that the pinnacle of the church year has passed, but for congregations across the Church of God, the joy of Easter is celebrated every week. With increased attendance and greater curiosity from a lost and hurting world, opportunities abound from the beginning of Holy Week through Resurrection Sunday. Not unlike last year, Easter 2016 saw souls surrendered to Christ and new believers baptized in numbers too great to count. Jesus was clearly the subject of Easter, and the story of his death and resurrection was clearly communicated from the pulpit to the pew. Hundreds of our churches chose to communicate such truth in especially creative ways. A few of them shared their experience with Church of God Ministries leading up to Easter 2016. HighPoint Church of God in Lake Wales, Florida, was one of many of our churches to offer the Stations of the Cross experience. But instead of the adults taking the lead, it was the children’s ministry department and pastors Ann and Gary Gramlich that put it all together. 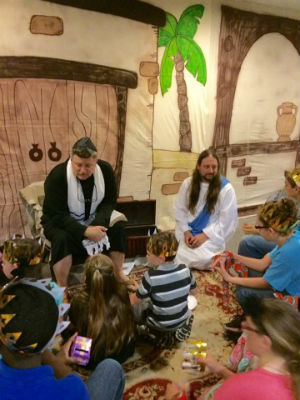 By engaging the children, the Easter story came alive among families. “They wanted to design something that entire families could experience together, which would open the door to future conversations parents could have with children about our faith,” Pastor Jack Hilligoss explains. Photo: Children in “Jerusalem” at HighPoint. First Church of God in Inverness, Florida, was one of many Church of God congregations to present a drama of the Last Supper. Like other presentations of the Last Supper, theirs transported participants and observers back in time to the Upper Room and the drama that unfolded. 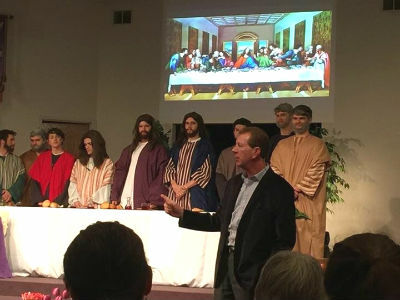 New Covenant Church in Middletown, Ohio, also presented the Last Supper. But their story involves a unique partnership with a public—yes, public—school. “It began with an administrator of the school, who had been a guidance counselor, and was with the school system for more than thirty years,” Pastor Randy Montgomery, an alumnus of Franklin High School, explains. “He was so well-respected that they would allow him to do this in a public school, which always amazed me.” Year after year, this administrator recruited twelve ordinary guys—reflective of Jesus calling his disciples—to play the role of the disciples in a drama of the Last Supper. Instead of gathering actors from the theater club, he rounded up football players and basketball players for the job. After the passing of the beloved administrator, the production ceased for a time, but in recent years, it was also resurrected. Photo: Randy, high school students, the Last Supper. This year, Pastor Randy was so moved by the production at the school that he simply asked for an encore presentation at New Covenant Church that would reach even more of the community. “The guys were very excited to do it again—even knowing they’d get no extra credit or grade for it,” Randy explains. “About half the boys are involved in church somewhere, none were involved in our church, but half had no church involvement. In fact, one student didn’t know anything about the Easter story.” The community turned out in droves, and each student that participated was given a Bible with their names engraved in it. Instead of just hearing the gospel, many experienced it for the first time. At Main Street Church of God in Anderson, Indiana, creative communication of the gospel meant employing all five senses. 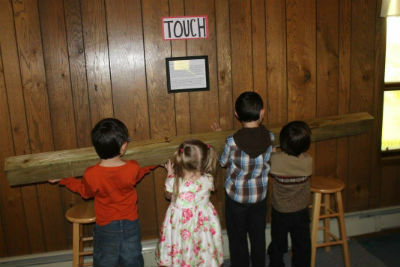 Instead of Stations of the Cross, these were stations where participants could touch, taste, see, smell, and hear elements of the Easter story. From Palm Sunday through Easter Sunday, people were touching a cobblestone pathway and lifting a cross beam to consider the Via Dolorosa, tasting portions of the Passover meal, seeing video clips of the Jesus film, smelling the scent of myrrh, and hearing a loop recording of nails being pounded into wood. Pastor Don Billey comments, “Some people are visual learners, some auditory, and some kinesthetic. By combining these learning types through the use of the senses, the story of Easter becomes more than a story; it becomes an experience that is more likely to have a long-term impact on those who go through it.” Send an e-mail to chognews@chog.org to request a copy of the text they used to encourage reflection and prayer at each sensory station. Another church hosted a drive-through Passion play. Prestonsburg Church of God in Prestonsburg, Kentucky, was featured on the local news for their creative outreach. Whether glow-in-the-dark Easter egg hunts that afforded opportunities to share Christ, doing community service projects on Easter Sunday morning, designating all offerings to community organizations, or theatrical and choral presentations, the Church of God pulled out all the stops to celebrate and communicate a risen Savior. This entry was posted in All Church of God, Great Lakes, Southeast and tagged Anderson, communication, community service, creative, Don Billey, Easter, Florida, High Point Church of God, Holy Week, ideas, Indiana, Inverness, Inverness First Church of God, Jack Hilligoss, Jason Johnson, Kentucky, Lake Wales, Main Street Church of God, Middletown, New Covenant Church, Ohio, outreach, Palm Sunday, Prestonsburg, Prestonsburg Church of God, Randy Montgomery, resurrection, worship arts. Bookmark the permalink.